Tone-Pot had the most liked content! 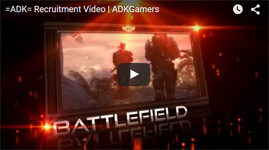 Yeah it looks like ADK has moved to the BF3 scene eh? For those of you that actually do remember me and why i left, i thought id give some insight on where i am since waaaay back in 2010 when i gave up admin position. I joined that 6s team and i joined a highlander team. The 6s team (also know as Chemical Reaction, or cr2) did CEVO-O and we were the 15th seed in playoffs. We upset the 2 seed in the first round but then lost 2 in a row. And in the Highlander i was on DMS or the Death Marked Soldiers and we won steel division. During that season i got a girlfriend and basically stopped playing entirely for the whole summer only to start missing the game again and wanting to play. Found a completely random group of guys and formed a team from it. We were decent, until we realized how well we competed against better teams. So after a few cuts and dealing with people that had major attitude issues, we now have our current team and we are competing in ESEA-O. [url="http://play.esea.net/teams/58828"]http://play.esea.net/teams/58828[/url] Just giving an update and coming back and checking out my old favorite pub server. Its really cool to see everyone again and still here. one of my favorite pics ever. and a nice senior picture for you all to laugh at. it was 7 am and i didnt fix my hair. ve had that boxed checked in and it still didnt work. but thatnks to the recent update it now works. Tone-Pot posted a topic in Spam Topic, Forums Games, etc. .
ever since i got this new account, the dingaling noise, or the ding it makes when you hit a player will not work. no matter what. any ideas what could be wrong? Im loving this new layout, looks so professional.